Pick a nice calm day, no wind. The wind will interfere with your measurements because it will push your boat. Travel into the current (or against it). The faster the better. Let your boat get up to speed. Mine takes 1 minute. Note the GPS reading and set the knot meter to equal the GPS reading. Reverse course which is best done by starting your turn in one direction and going hard over the other way when you are half the distance it take you to pivot. When you are done, you should be traveling down your bubbles. Note the GPS reading and the knot meter reading. If you have current, they will be different. Set the Knot Meter to half the difference between the GPS reading and the Knot Meter reading. In other words, if the two readings are off by 2.6 knots, change the knot meter reading by 1.3 knots toward the GPS reading. Make note of the remaining difference which in the above example should be 1.3 knots. Note the GPS reading and the knot meter reading. You are going 6 knots by the GPS and the Knot Meter says 5 knots. You think there is a 1 knot current. Set the Knot Meter to 6 knots. 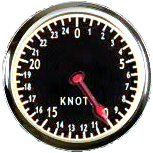 Your knot meter still says 6 knots because your engine speed is the same and there is no wind. Your GPS, however, says 4 knots. This is a difference of 2 knots. Half of that is 1 knot. Your actual speed is 5 knots. Your knot meter is now high so decrease it by 1 knot to 5 knots. Well, it was correct to begin with but it is still correct and now you know it is.